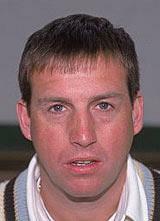 Timothy Alan Munton (born 30 July 1965, Melton Mowbray , Leicestershire) was an English cricketer. He played two Test matches for England in 1992, but struggled to make an impression and was never selected again. A poor batsman, he averaged just above 10 in first-class cricket, with a highest score of 54 not out from 272 innings. Cricket writer Colin Bateman stated, “at 6ft 6in, with an ability to make the ball swing, Munton is at his best in English conditions”. Munton played the bulk of his career for Warwickshire, making his first-class debut for the county against the touring Zimbabweans in 1985. His first County Championship appearance came a year later. He was Warwickshire’s player of the season three times, including in the county’s treble-winning 1994 season, when he took 81 wickets. Munton suffered badly from injury, missing half the 1995 season and all of 1997, but in both 1998 and 1999 managed to average under 20 with the ball. In 2000, he moved to Derbyshire, making his final first-class appearance in July 2001. In first-cricket, Munton took a total of 737 wickets at 25.86 apiece. Munton was one of the five Wisden Cricketers of the Year in 1995.